This is an English locational surname. It originates from the small town of Halesworth in the county of Suffolk which in 1960 had a population of about two thousand. The place name is first recorded in the year 1086 in the famous Domesday Book as 'Healesuurda'. This translates as 'the hero's wood'. According to Ekwalls Oxford Dictionary of English place names, this may have been a reference to a local warrior, or it may have been an early personal name, which is also found in the place name and surname of Hallsall. Locational surnames were usually 'from' names. Tnat is to say names given to people after they left the former homes, to move somewhere else. The easiest way to identify such 'strangers' being to call them by the name of the place from whence they came. The surnname is well recorded in the surviving church registers of the city of London. However it is listed there as being the same as the Yorkshire name of Holdsworth. 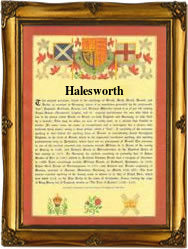 They are quite separate but it would seem that they share a variant in Halsworth, which may originate from either name. These early examples include Timothy Hainsworth at St Dunstans in the East, Stepney, on May 19th 1617, Thomas Halsworth, who married Susanna Greene at St James church, Dukes Place, on January 11th 1665, and Robert Halesworth, the son of Samuel, who was christened at St Botolphs without Aldgate, on October 10th 1819.